The web-based management page of TP-Link routers is a built-in internal web server that does not require internet access. It does however require your device to be connected to the TP-Link router. This connection can be wired or wireless, so you can log into the management page from the desktop computer, phone, tablet, iPad, etc. Note: Low version of your web browser may cause compatibility problem with the web-based interface(management page) of your device, such as unable to log into the interface, display incomplete features etc. Step1a: If Wireless, connect to your TP-Link wireless network. Find the wireless network (named TP-LINK_xxxxxx by default which is printed on the label of the router) from the WiFi list on your device and connect it with the wireless password (default password is printed on the router's label as well). Step1b: if Wired connect your Ethernet cable to one of the LAN ports on the back of your TP-Link router. Open a web browser (i.e Safari, Google Chrome or Internet Explorer). At the top of the window in the address bar, type in http://tplinkwifi.net. The default access address differs by model. Please find it on the bottom label of the product. 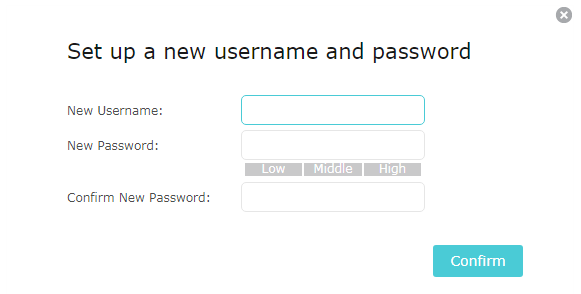 Type the username and password in the login page. The default username and password For TP-Link devices is admin. Enter your own username and password instead of admin if you already changed it. All letters for both username and password will be lower case. If you forgot your uersame or password to login, please find reset button/hole and reset it to the factory default settings. Once you log into the web-based Utility (Management Page), you can change settings of your router, such as create a new wireless password etc. Please refer to: What should I do if I can’t log into web-based interface of my TP-Link device?